For many months now, I have been madly in love with a particular salsa at our local Mexican joint. There are the usual salsas and then there is this thick, fiery, tangy concoction that sets my heart tongue ablaze. It is the chile de arbol salsa that is part of their salsa bar, and I finally decided that I must make it at home so I can unlimited access to this addictive stuff. I'm too shy (hah!) to ask them for the recipe, however, so this restaurant envy must be overcome by good old trial and error. At the international store, I always catch myself staring at the wall of dried chile peppers, whispering the lyrical names- ancho, pasilla, guajillo, habanero- and this time, I actually remembered to buy a pack of the chiles de arbol. 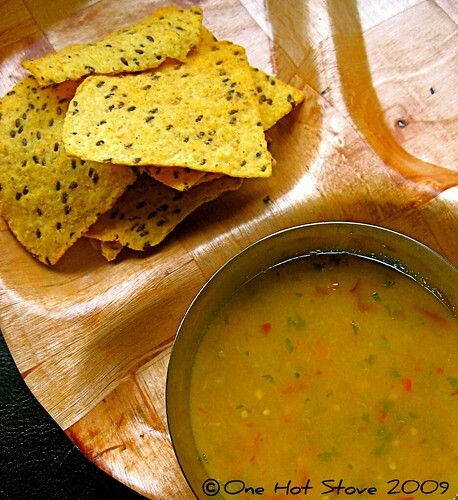 A hunt for a salsa recipe yielded this recipe on Slashfood that comes from a Mexican chef, and it seemed like a good place to start. With only 5 ingredients- chile de arbol, tomatillos, olive oil, onion and cilantro- I knew that this salsa would have clean flavors at the very least. Here's how I made the salsa. 1. Heat oil and saute the chiles de arbol briefly. 2. Add tomatillos and water. Bring to a boil and simmer for 10-15 minutes until the tomatillos collapse. 3. Turn off the heat. Add onion and cilantro and let the mixture cool for a bit. 4. Blend it into a thick salsa. Add salt to taste. I scrambled around to grab a spoon and taste the salsa as soon as it was ready. The color of the salsa was disappointingly insipid, but it tasted pretty darn close to the stuff in the restaurant!! These are FIERCE peppers- apparently the chile de arbol only rate in the middle of the Scoville heat scale, but their heat is searing and I used a lot of them in this salsa. Next time I make this salsa, there are some tweaks I might try, based on other recipes I found on the web, such as using a combination of tomatillos and red tomatoes (to give it the bright red color "just like in the restaurant"), adding a bit of garlic or roasting the tomatoes and tomatillos for a smoky flavor, but I love this version of the salsa already. I'm sending a bowl of this fiery salsa to the Monthly Mingle: Mexican Fiesta edition. Yummmmmmmmmmmmmm! This one is HOT HOT HOT! I also love salsas too much!! Looks yumm. I have never cooked anything Mexican, have to do it sometime. Your recipe is tempting. Lavanya- Now you are making my mouth water! Salsas are rather easy to replicate at home, the best ones have few ingredients, I think. Tamales and salsa- sounds sooo good! Linda- I am jumping between Latin American inspired and Middle Eastern inspired these days! Please share with us what you make with the aji panca paste, it sounds delicious! Cathy- Oh, this one is searing hot, but that's because I used 10 peppers in what was a couple of cups of salsa. 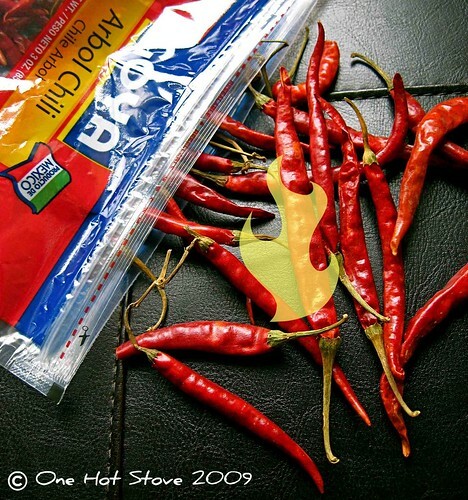 You could dramatically reduce the number of chillies and still get something spicy and flavorful, for sure. I love salsa that's hot enough to make you sweat, and this sounds like one of those salsas. I'll definitely try it, with the full number of chilies. A lose handful of dry Chiles de Arbol, stems removed. a deep fry pan or a casserole. Put the whole tomatoes, the onion cut in quarters in the pan/pot and gently fry until the tomato skin and the onion is brown in some places. Add dry chiles and fry for about 1-2 minutes. In a blender put 1/3 (approx) cup of water. Add all the ingredients from the pot/pan plus the cilentro stalks and blend to desired consistency , byt adding more water, if required. Return to the very hot pot/pan ...it should spluter and cook for a few minutes.....the color will change to a beautiful red. Season with salt....I use Bovril...most mexican housewives use Maggi, Knorr or similar. The same Salsa can be made raw in a blender and then cooked ...it takes all of 5 minutes. Real chile de arbol salsa does not have tomatillos, because tomatillos make it Salsa Verde ( green sauce ). I forgot to add that the handful of chiles is what I use. I like it fiery. what a great combination Nupur! I agree tomatillo would add another layer of tang to the salsa. I can't wait to try this too! * Rather than sauteing briefly in oil, dry roast the chiles in a hot pan. "Until it feels like chemical warfare in your kitchen," according to my cook buddy. * Throw in a couple of roughly minced cloves of garlic along with the onion. * For additional sweetness and flavor, and to stimulate that rich, deep , red you're going for - add a tablespoon or two of tomato paste. I know it's sounds like a cheat - that's what I said when he told me - but it works a treat! Your recipe for the salsa is droolworthy. Here in Texas, I too, love to gaze at the various chillies and peppers I see at the mexican stores wondering the degree of heat and spiciness. This one I am definitely going to try! Lydia- YAY for spicy food; please do try this, I think you will love it. Lisa- Next time, I might go just a bit lower ;) my taste buds are nearly seared off but it was sooo good! Droelma- Thank you so much for taking the time to share your recipe! It sounds fantastic and I will be making it very soon. I'll write a post to let you know how it works out. I am intrigued by the use of bovril instead of salt for seasoning. Maybe I will use my vegetarian stock base, I can see how that would add more flavor than plain salt would. Mandira- Tomatillos do add a great sour punch to this salsa, and I am still enjoying this salsa very much as an after-work snack with chips. David- I really appreciate your comment; thank you for sharing these secrets! I am definitely going to try these tweaks and will let you know how that goes via another post here! Namita- I'm be working to tweak this recipe but it tasted great to begin with...living in Texas, you must have access to wonderful chillies and peppers. This salsa is worth a try! What a refreshing recipe! Loved the picure. I too have a similar looking wooden plate. Great recipe and blog, I love making various salsas using gaujillo, pasilla, puya, chipotle, chile de arbol, cascabel etc. In fact, one of my recipes uses 5 kinds of chilies, it's called "salsa des muchos chiles" - salsa of many chiles - aptly named! I dry roast my chilies and I also fire roast tomatoes for a smoky flavor. You can use organic canned fire roasted tomatoes (Muir brand). By salsa I guess you mean hot sauce and not diced onions, tomatoes, and spices (salsa mexicana). Keep refrigerated, eat within a day or two and NEVER add vinegar. That "salsa roja" is the same ocher color in the restaurants here in Tucson.